To set the Address of the B450, using the chart below, address your B450 accordingly by manipulating the Rotary Switch. *Now that your physical address path is set we can configure the panel to communicate through it. *For this example we will use SDI2 Address 1 Path 1, we have set our Rotary Switch to 1 on the B450. 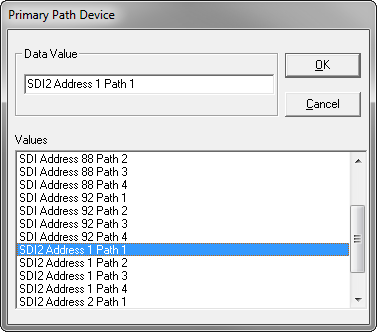 In the Route Group double-click the Primary Path Device to select the communication path. Next we will configure your central stations receiver settings. Under Enhanced Communication, enter in your Network Address (this is the IP address of your central station receiver). 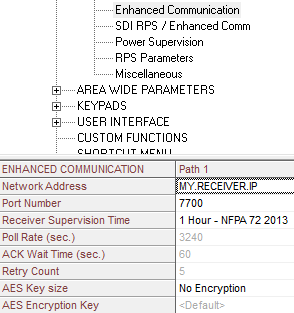 Designate the port, this is defaulted to 7700 for UDP traffic. (Verify with your central to confirm port forwarding rules). Set your Receiver Supervision Time, this is defaulted to NFPA 72 2013 and can be adjusted up or down depending on your supervision requirements. *This will need to match your central station receiver’s supervision time to avoid erroneous communication troubles. *check recommended settings to confirm you are on the appropriate plan for your usage. Save your Data and push the changes to the panel. Power cycle the panel and within 2 minutes your device will pull down an IP address and begin communicating on the network. *Optional step: If, utilizing a B443 Sim based module you will need to configure the appropriate APN (Access Point Name) for the cellular module to communicate on its corresponding SIMs network.